Some of you know exactly which designer handbag you want to invest in. In fact, you might always reach for the same style, colour and brand each and every time, safe in the knowledge that you'll get endless use out of it. But sometimes, The One can sneak up on you. Case in point? In February of this year, I got my hands on a new mini bag from Wandler, and honestly, I've never had a purse with such a compelling cost-per-wear proposition. Wandler is a Dutch accessories label, and its spring/summer 2018 collection quickly gathered a huge fashion fan club—especially for its half moon–shaped Hortensia bags in off-beat colours like apple green and baby blue. These neat, minimalistic purses were all over the streets of fashion week, and team Who What Wear was not immune to the brand's charms. However, mine was a rather risky, very un "me" option made of white leather. And yet, almost half a year later, I still use my little Wandler bag at least three or four times a week (and it hasn't aged a bit). It has some sort of magical, neutral, "go with absolutely everything I own" power. Since white is bolder than a typical neutral shade (and definitely more uplifting than black), my bag has got me into a summery mood. This simple addition—along with a small Danse Lente crossbody style that I've been wearing lately—made me realise nothing in my wardrobe has seen quite as much daylight in 2018 as my white Wandler bag. Scroll down to see the many outfits that work with a Tipex-white bag, and then shop some of my favourites below. Style Notes: I love gold hardware, jewellery and even chain belts, so the fact that this white bag features the same finish makes me very happy. I can virtually pair it with anything I already own. Style Notes: The bag even works with tights and wintry florals. Since this Rixo dress features white in its print, the summery bag still seamlessly fits in. Style Notes: The Wandler mini Hortensia also has a crossbody strap, which makes it the perfect accompaniment to my holiday wardrobe for a quick trip to Lisbon. 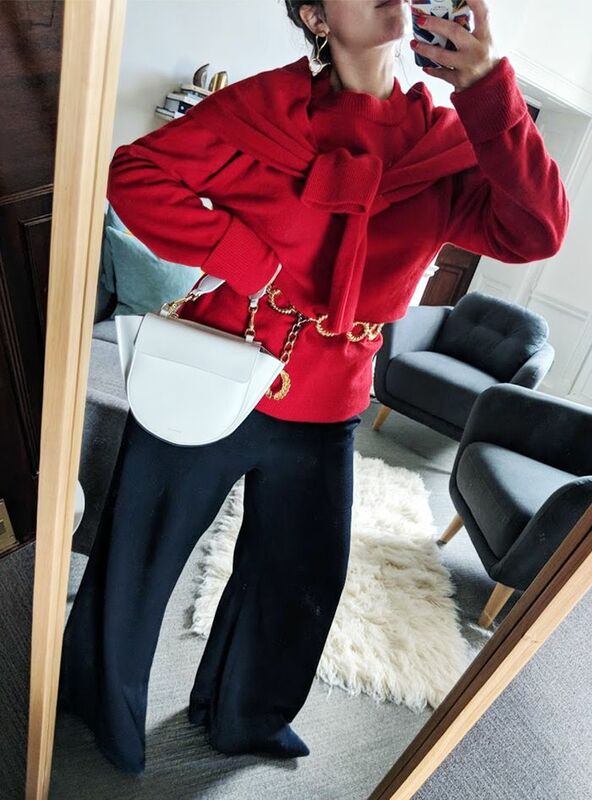 Style Notes: Here's the Danse Lente white bag in action—a neat addition to when I wore my shaggy vintage coat and wide-leg See by Chloé trousers for a cold February day. Style Notes: I've now worn this red Mango suit about 400 different ways, but one of the easiest is with a plain tee and the Wandler bag (plus some statement earrings). Style Notes: Camo pants (from skate brand Obey) and loud shoes could be a bit OTT, but a white blouse and matching bag really help diffuse what's going on in the bottom half of my outfit. Style Notes: Many summer bags could look too twee with this floral Ghost dress, but there's something really unobtrusive about carrying a small white style instead. The very same one that I own. You'll feel inclined to swing this around and maybe skip down the street. If you want something a little alternative. Trust me—everyone's going to be talking about this brand soon. For those of you who can't handle mini bags, this is pretty roomy. If you want to stand out, this is the optimal choice. A very classy high-street option. We've heard that French girls like this brand. You can put your name down on the waiting list for this sold-out beauty. There are three of these Staud bags in our office! Still as cute as the day it launched. A now-classic option from the New York–based brand. This one has the vibe of a basket bag but is so much more grown-up. The coolest way to wear a Miu Miu logo. Adding these to your 2018 shopping list? We can't blame you—they're summer-ready.